Danger levels rose sharply in late April for northeast Syria’s isolated Assyrian Christians, caught for nearly three months now between Kurdish militias and Syrian army forces battling with militants of the self-proclaimed Islamic State for control of Hassaka province. According to Australia’s Archbishop Mar Meelis of the Assyrian Church of the East, who spoke to Newsweek on May 1, the IS jihadists demanded a ransom of US $23 million, or about $100,000 per person, to release their Khabur captives. The militants reportedly described the ransom as the jizya – a payment required under Islamic law for non-Muslims who refuse to convert to Islam. 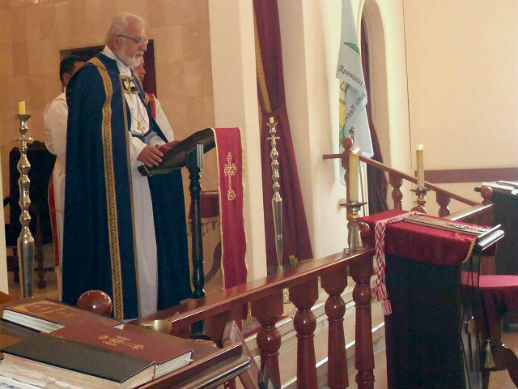 of the Assyrian Church of the East in Beirut pores over a steady stream of Lebanese visa applications for displaced Assyrian Christians from Hassaka, Syria. 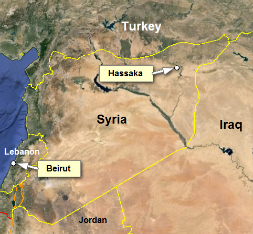 “The situation in Hassaka is bad, and very fragile,” Archimandrite Emanuel Youkhana of the Assyrian Church of the East told World Watch Monitor. The clashes have now come close to the suburbs of Hassaka city, where the archbishops of the Assyrian Church of the East and the Syriac Catholic Church are headquartered. Only 800 Christian families remain in the province, he said.